Official data shows that both Aberdeen and Moray had almost double the number of the “vital” staff as Dundee in 2017, while Shetland had twice as many as Orkney. Highland Council had the third highest number of pupil support assistants (PSAs) in secondary schools, with its 193 staff only surpassed by Glasgow and Fife. 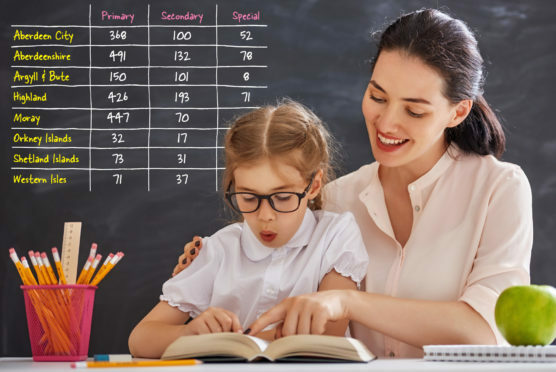 But the region’s 426 primary school PSAs was fewer than the 447 in Moray – despite Highland having more than three times the number of primaries. With 491, Aberdeenshire had the third largest total in primary schools, after Glasgow and Edinburgh, with Moray having the fourth highest. Overall, there were 2,948 of the PSAs at the eight councils in the north and the north-east – about 23% of the 13,063 across the nation. Combining primary and secondary, Glasgow had the highest total with 1,525, followed by 863 in Edinburgh, 854 in Fife, 813 in North Lanarkshire, 737 in West Lothian, 702 in Aberdeenshire, 691 in Highland, 653 in South Lanarkshire, 519 in Aberdeen City and 516 in Moray. Orkney had the fewest PSAs, with a total of 49. Shetland had the second lowest number, with 104. The PSA data combines the previous “additional support needs auxiliary or care assistant” and “classroom assistant” categories. Donald Cameron, Scottish Conservative MSP, said: “The vast disparity between local authorities across the Highlands and islands and beyond shows what a mess Nicola Sturgeon has made of Scotland’s school system. A spokeswoman for the Educational Institute of Scotland teaching union said: “Cuts to PSAs diminishes important one-on-one support for pupils who need it and can seriously hinder a child’s educational experience. Deputy First Minister John Swinney said: “There are more than 13,000 pupil support assistants in Scotland in 2017.